Summer and BBQ. You just can't beat that! My not so secret weapons for making the most of it? 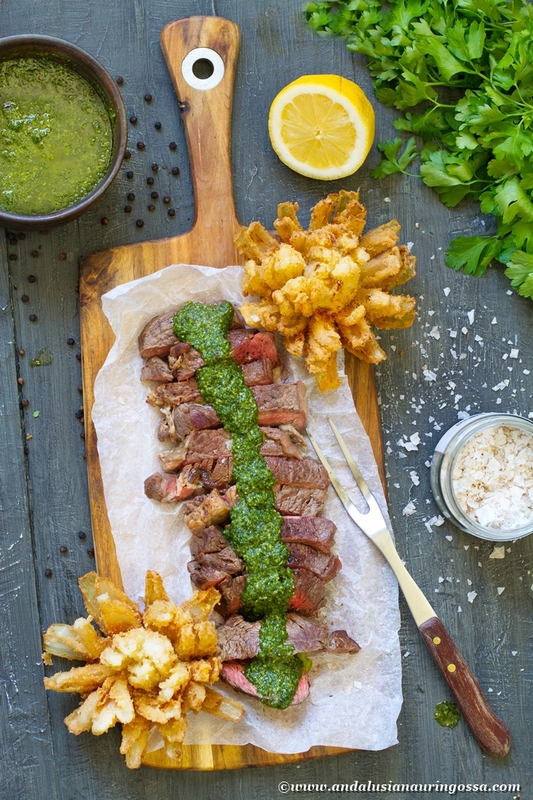 Big, juicy rib eye steak, chimichurri and gloriously crunchy deep-fried onion blossoms. Another dressing worth trying would be Romesco. And hey - how about a little surf and turf with this mango, chili and crayfish dressing? In case cutting your onions into blossoms is just too Hyacinth Bucket for you, just cut the onions into 1 cm thick slices and folow the steps down below. Trust me - you're not going to want to miss out on these babies! Take the meat into room temperature a couple of hours in advance. Pat the steaks dry, brush with a little bit of oil and grill for 3 minutes on each side. 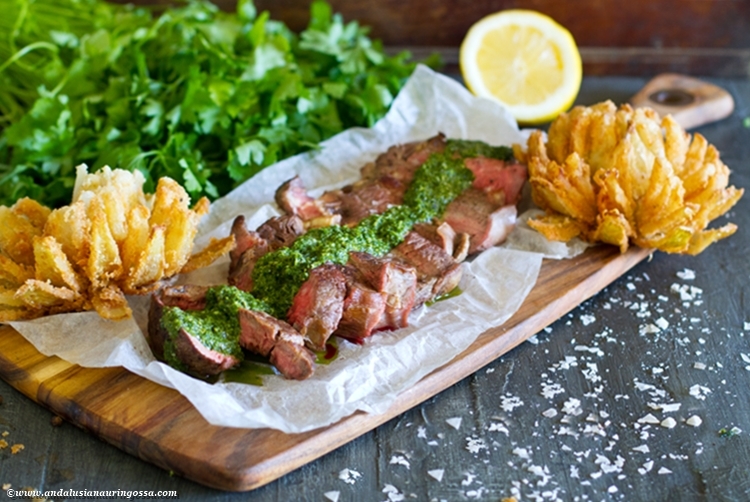 Season with salt and pepper, wrap in tin foil and leave to rest for 15 minutes. In case you use a pan instead, heat it up, add a couple of tbsp of oil and a similar knob of butter. Cook the steaks in the mixture, basting them ever now and them . Wrap in foil and leave to rest. In the meanwhile prep the sides. Measure the ingredients into a food processor and blizz until smooth. Check the taste and adjust with salt, pepper and/or sugar if needed. Cut off about 1,5 cm piece off the top of the onion (not the hairy stem). Peel the onions and place them on a achopping board cut side down. Starting about 1 cm from the stem, cut the onion all the way through to the middle on all for sides, then repeating it 2-3 times in each quarter (depends on the size of the onions). Turn it around and gently separate the "petals" from each other. Combine the dry ingredients in a deep bowl. Toss the onions in it, one at a time and the dip into the egg (spooning some of the mixture inside the petals if needed). The coat them in bread crumbs (again making sure you get some inside the petals, too). 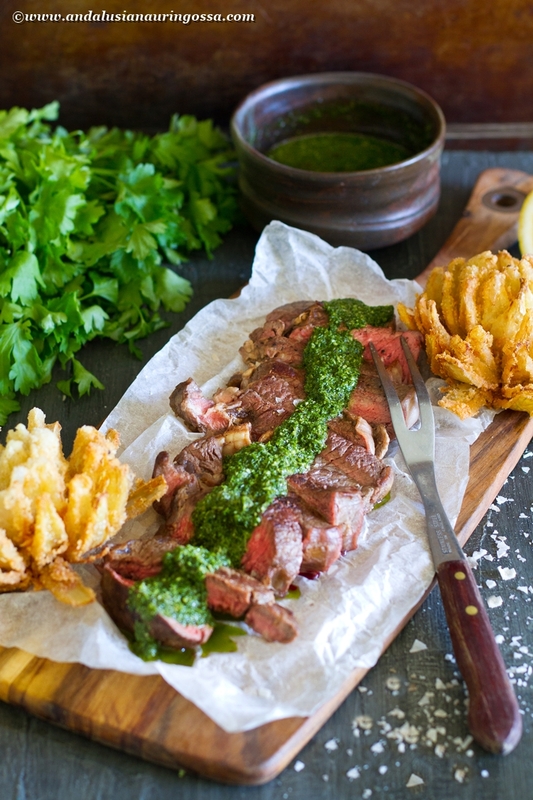 Shake off the excess and deep fry until golden and crunchy. Drain on kitchen towels and serve. Aptly enough for the Souther American vibe (oh, bit, are they onto something with their meat feasts...! ), the wine pairing comes from South America, too. 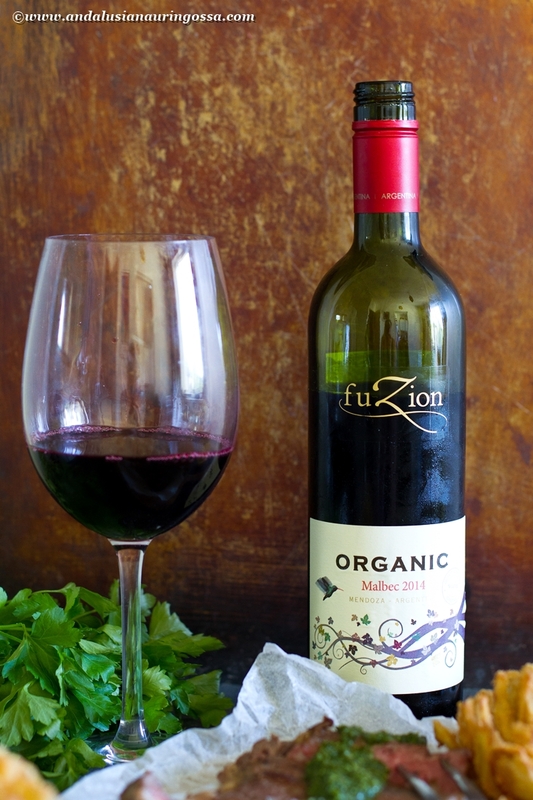 Fuzion Organic Malbec is cheao and cheerful organic Argentinian - exactly what casual , fun get togethers call for. It's medium bodied with soft berry notes and juiciness that make it a easy pairing for a variety of BBQ treats. The jamminess pairs well with spicier dishes, too!